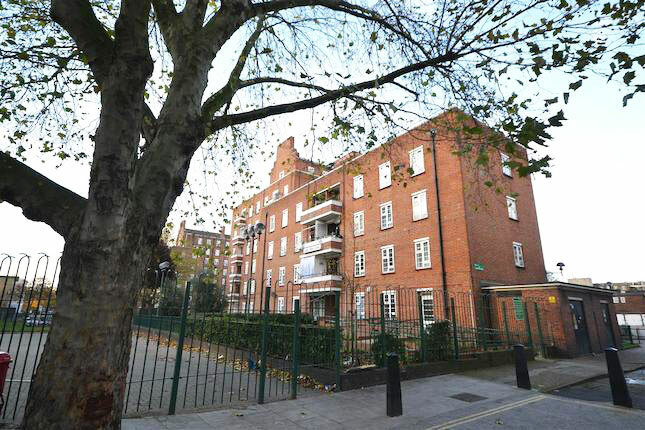 As part of the refurbishment to meet the decent home standards, two residential blocks in Camden Town, London, NW1 were both in need of external concrete repairs, but in each instance was the consequence of very different problems. The walkways at Cobden House are of filler joist construction, with clinker concrete infills, rendered and painted. Here corrosion was due to water ingress from above and causing spalling on the soffit surface. Gloucester Avenue is a tiled concrete frame building. Water ingress behind the tiles had caused the reinforcement within the concrete to corrode resulting in concrete spalling and debonding of tiles creating a hazard for pedestrians below. At Cobden House loose and defective concrete and render were removed. The steel filler joists were then mechanically wire brushed and primed, followed by the installation of stainless steel mesh. High build polymer modified hand placed repair mortars were used for reinstatement. A thin cementitious filler was then applied to the soffits to cover the mapping effect caused by the removal of defective paint, followed by the application of a pigmented anti-carbonation protective coating. At Gloucester Avenue traditional concrete patch and girth repairs were carried out where localised spalling had occurred. The tiles were reset with stainless steel pins drilled and resin fixed through their faces with a colour match mortar to disguise the pin head. There was also a concern about the risk of further spalling where there were no signs of deterioration. The application of a migrating corrosion inhibitor (MCI) to the concrete to reduce this risk would have required the complete removal of the tiles. We were able to offer an alternative to this that saved the client both costs and programme. Holes were drilled through the face of the tile at 200mm centres along the front elevation of the building and Margel Vapour Phase Release pellets were inserted. These act similarly to an MCI without the need to remove any finishes. Tiles were then repaired similarly to where the steel pins were installed.